I have always been a fan of Renee's Garden seeds and the predecessor seed company Shepherd's Seeds (before it was sold). 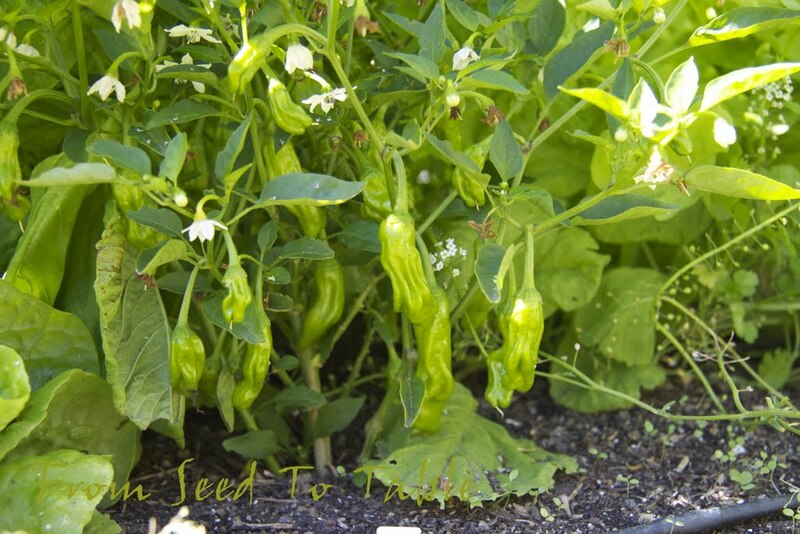 The company is locally owned and all the seeds are trialed locally and in other climate zones which generally means that they will do very well in my climate. The seeds are also very conveniently carried at many of my local garden centers and other outlets. They may not grow the seeds themselves, but Renee Shepherd chooses select heirloom, open pollinated, and hybrid varieties that taste good and perform well for home gardeners. 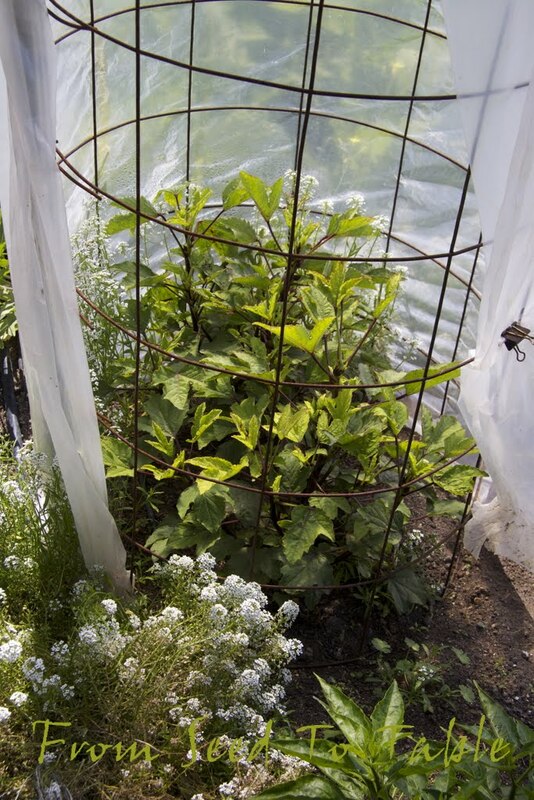 Last year I was offered the chance to trial a number of varieties of vegetables, herbs, and flowers for free, all I have to do is report back on how the plants did for me. 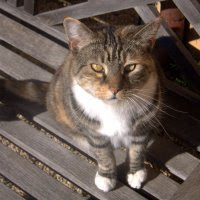 I'm going to publish a series of posts about the varieties that I've trialed. 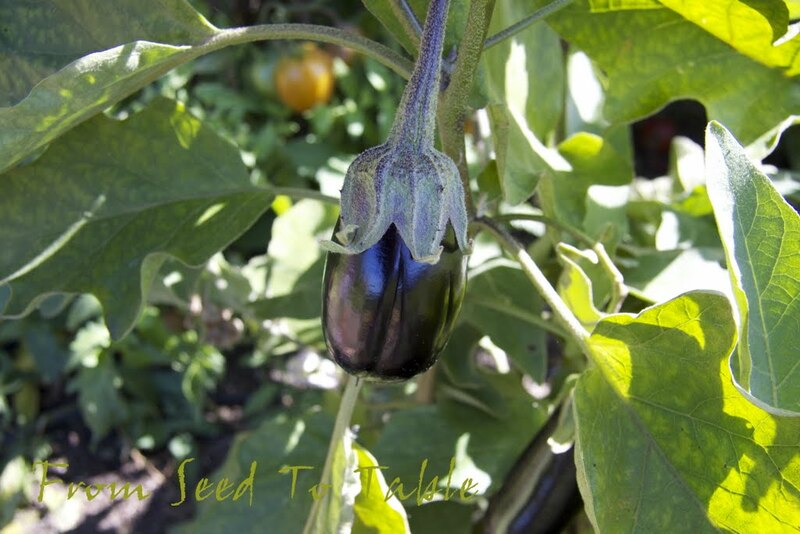 I am a bit ashamed to say that I didn't manage to grow everything that I availed myself of, but I'm going to try to make up for that by reporting on the varieties of Renee's seeds that I purchased myself and when I get around to growing the overlooked stuff I'll report on that. Cucumber, Baby, Persian, "Green Fingers"
Pea, Snap, "Super Sugar Snap"
Today's report will be on the cucumbers. 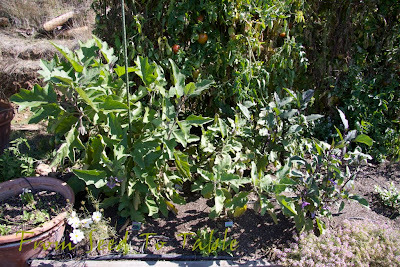 Cucumbers were a mixed bag this year and that wasn't the fault of the seeds or the varieties. 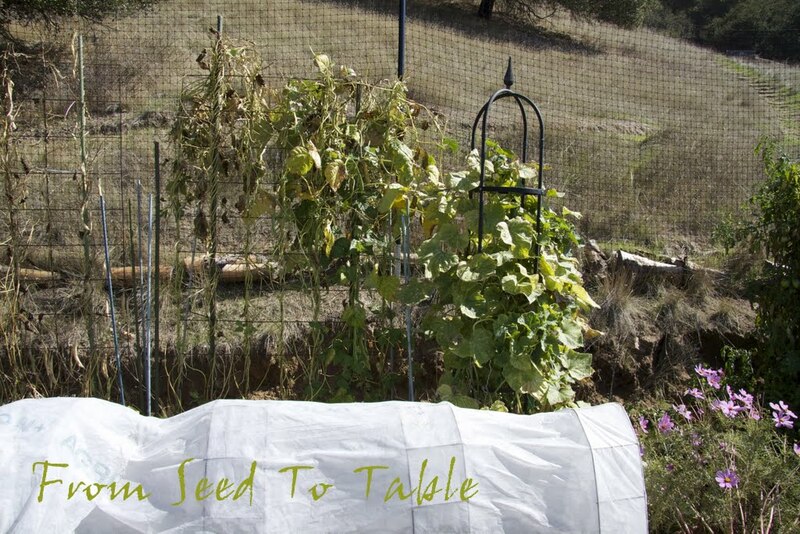 I sowed the cucumber seeds in 4-inch pots on May 23 and planted them out in the garden on June 10. The young plants grew well and bloomed profusely but I kept wondering when the flowers would start to set fruits, they were blooming away but there were no cucumbers forming. Then I figured out that the tiniest baby cucumbers were being nipped clean off by marauding rats, arrrgh. I had to enclose the cucumber vines in row cover which you can see on the right in the photo below. Most days I pulled the cover away, then I pulled the cover back up for the night when the rats are most active. After a while I started finding young cucumbers, look closely and you can see them on the vines. There are actually 2 varieties of cucumbers growing up the tower, Tasty Green Japanese and Green Fingers Persian which I discuss later. Finally, a cucumber with just a slight bit of gnawing at the stem end which I harvested on August 6. The rats eventually moved on to tastier garden treats and mostly left the cucumbers alone so I was able to remove the row cover. I managed to harvest about 5 pounds of Tasty Green cucumbers from 2 plants in August and September. 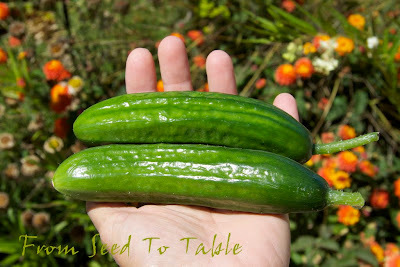 The plants are making a slight comeback at the moment and I'm getting a few small cucumbers even now. The vines seem to be resistant to powdery mildew even though they aren't touted as such. They are not hugely prolific but produced at a nice steady pace, not too much nor too little. 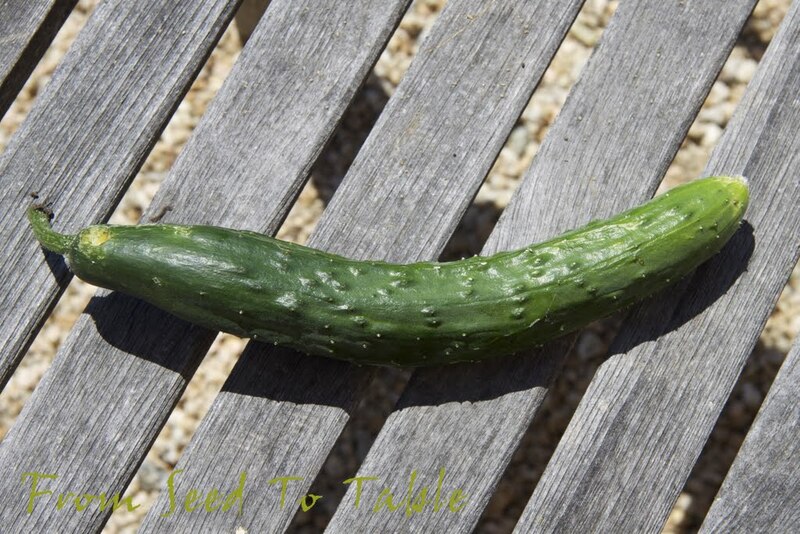 The cucumbers themselves are thin skinned with just a few tender spines when harvested young. 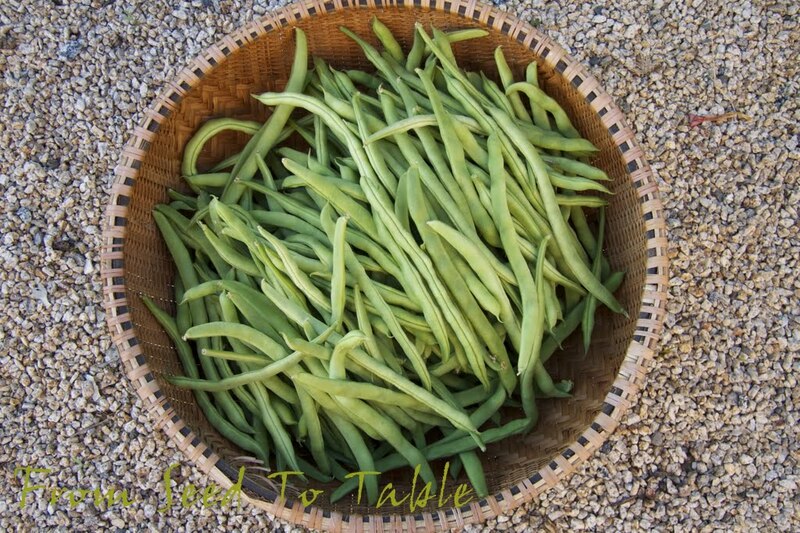 They are crisp and delicous, perfect in salads. These are lovely, smooth, thin skinned, and seedless cucumbers. 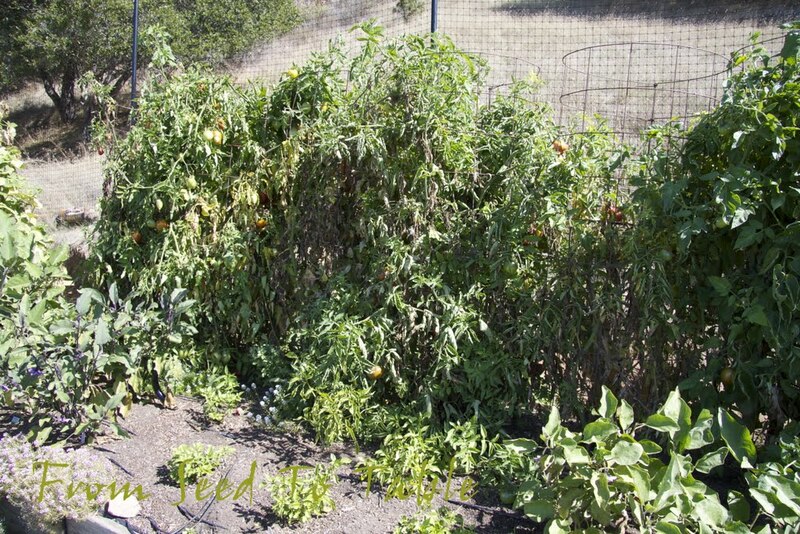 This is a self-pollinating and very prolific variety. 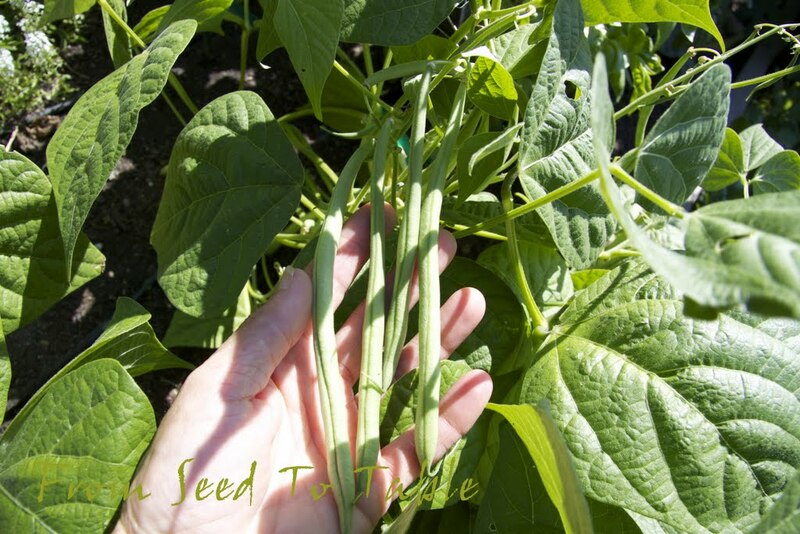 They can be picked as small as 3 inches long but even when they get a bit larger they stay thin skinned and sweet without seeds. The cucumbers don't develop seeds until they get quite large and spiny. 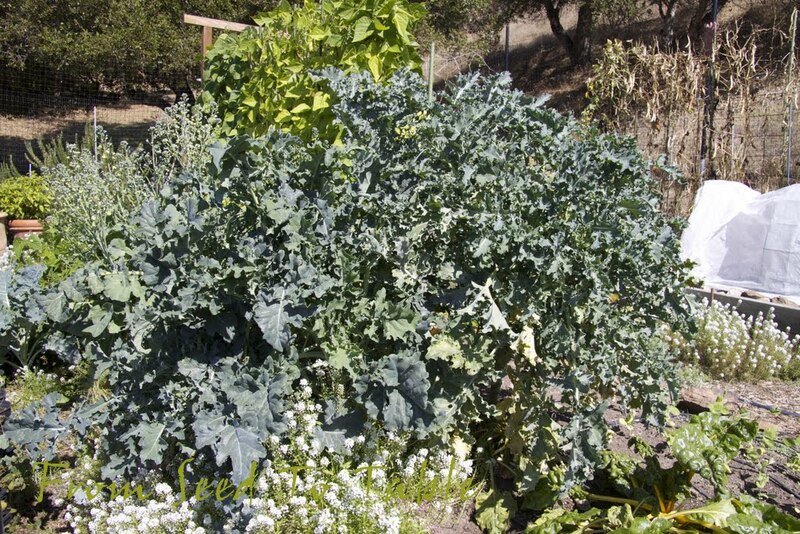 I love to snack on them out of hand but they are also great in salads. These cucumbers were sown and planted out at the same times as the Japanese cucumbers. 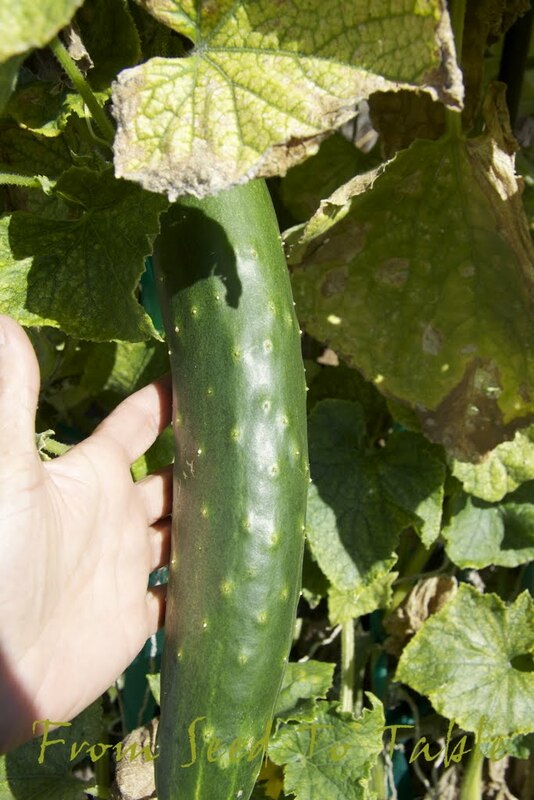 I harvested the first Persian cucumber on August 10 and have harvested 8 pounds from 2 plants to-date, not including rat gnawed and overgrown specimens that ballooned up while I was on vacation (chicken treats). The vines are quite resistant to powdery mildew, a plus in my climate. 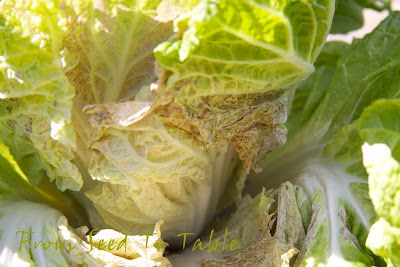 Any plant in my garden that has any susceptibility to powdery mildew inevitably gets covered with it and is generally short lived. 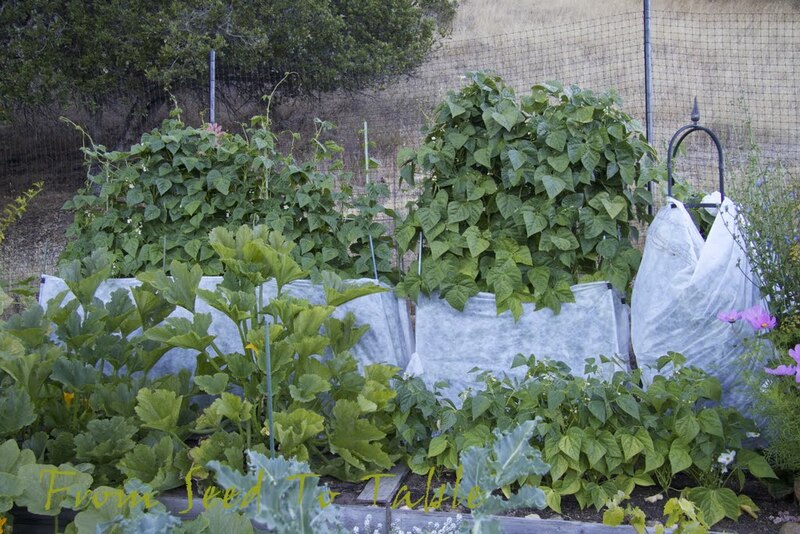 The vines for these plants have been in the garden since June and are still producing a few cucumbers as the calendar moves into November. I will definitely be growing these again next year. 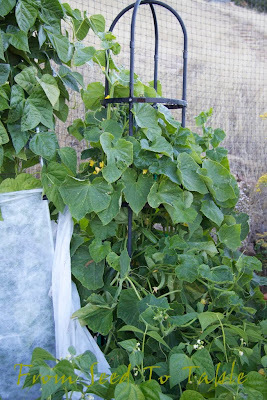 Now, if the rats would just leave the cucumbers (and other veggies) alone next year I might get an even better result! It's time for another overview of the garden. 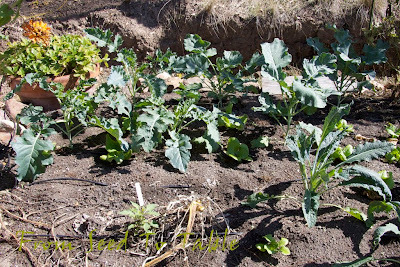 I made a number of changes at the end of September, it was time for some of the summer vegetables to make way for fall/winter plantings. 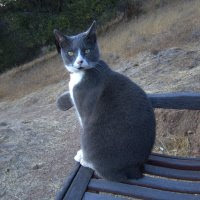 It was something of a mad dash on my part, I had a lot of summer vegetables to harvest and preserve, and then I had a lot of seedlings ready or nearly ready for planting out and it all had to be done in the 2 weeks before I left for vacation. 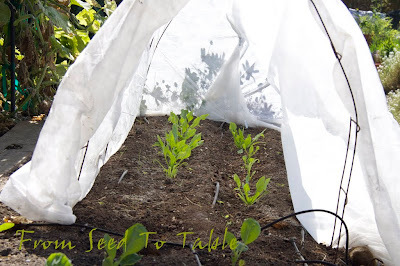 Some seedlings got stuffed into the garden in the hours before I had to depart and I didn't have time to provide them with the usual rat protection. The rodents raided but didn't do as much damage as I anticipated, at least to the new vegetables. This area was home to the Marina di Chioggia squash for the summer, you can see the dried stem of one last plant that I left to support one last late set squash that I harvested today. 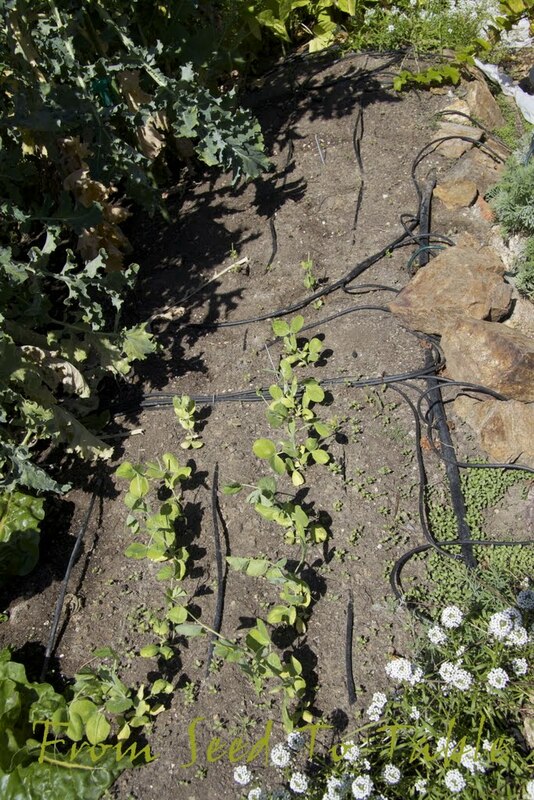 In the rear are new plantings of Di Sarno Calabrese broccoli and Piracicaba broccoli. 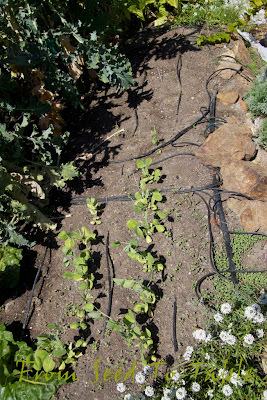 I also set some Buttercrunch lettuce seedlings out between the broccoli plants. Those were one of the last minute divide and stuff into the ground transplants that I fully expected the rats to feast upon. Lucky me, sort of, the rats are feasting on other veggies at the moment. I also got lucky with the weather, it rained quite a bit just after I left and settled the plants in nicely before a heat wave hit. 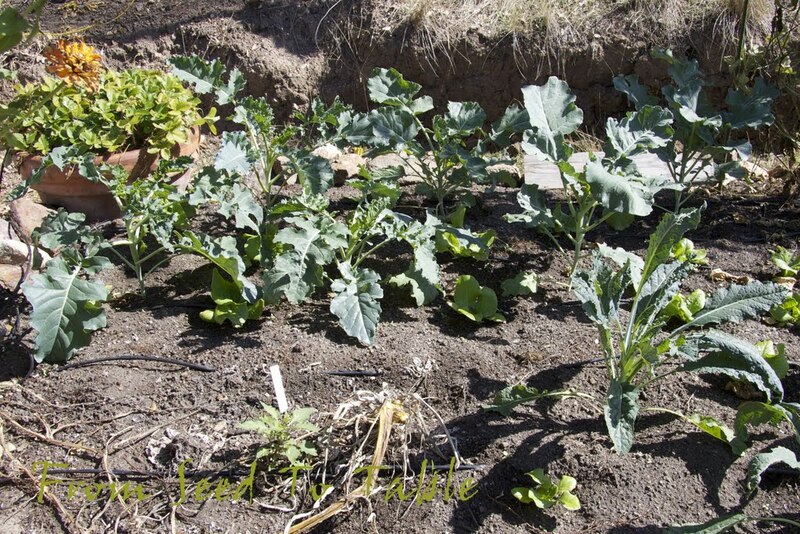 Another part of this bed is home to the new Lacinato kale plants along with their new lettuce companions. These are taking the place of one of the old zucchini plants. 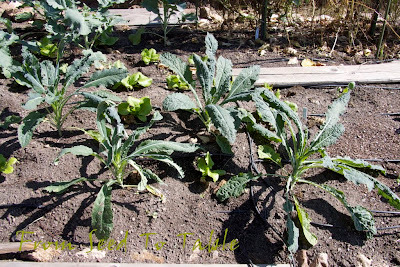 I did another stuff and run job where the other zucchini plant was with the Pixie Baby cabbage seedlings and seem to have gotten away with that as well... so far. Behind the Pixie babies are the Tarbais beans. 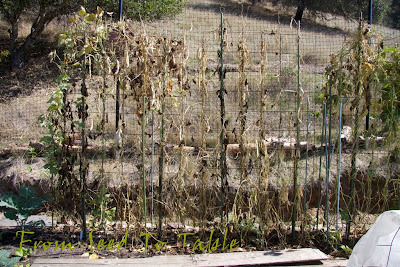 What's left of the beans after the rats have had their way with them are nearly dry enough to harvest. Perhaps I'll get enough for one batch of cassoulet. 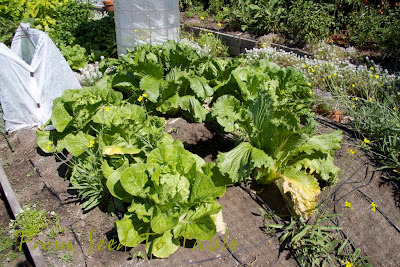 The Guntmadingen Winter spinach was transplanted a little earlier so I had time to put a protective cover over it, but something, most likely sow bugs, thinned the planting out for me. This is actually the second set of transplants, the first tray of them were devoured by rats before I could even set them out in the garden. Well, I'm happy there's something left of this planting and perhaps it's not too late to get more started if I get on it right away. 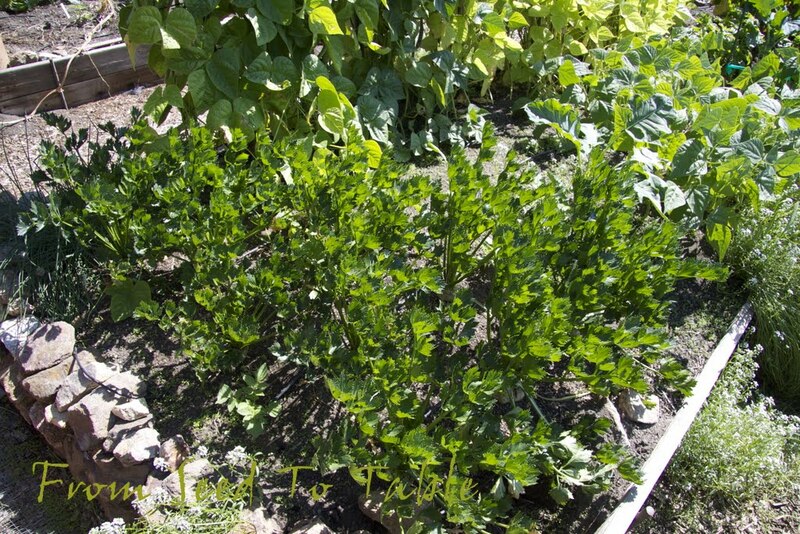 Behind the spinach are the kaput Musica green beans. I harvested over 18 pounds of beans from that planting, perhaps more, I don't remember if I harvested any in the week before I went on vacation and my harvest notes for that week are lost. 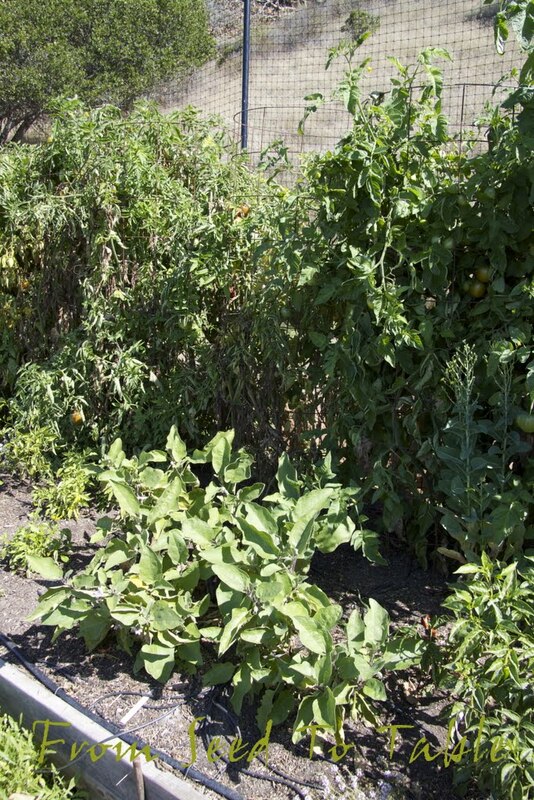 To the right are the old cucumber vines. The cucumbers produced a few fruits in my absence but most of them got quite large and will be chicken treats. 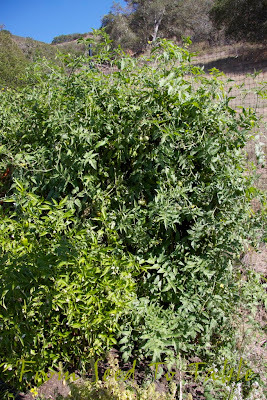 The solanum bed is still chugging along. These are the Black Beauty, Rosa Bianca, and Orient Express eggplants. The plants are looking better since I treated them for spider mites and some caterpillar that was chewing on the new growth and flower buds. Some of them are setting new fruits. 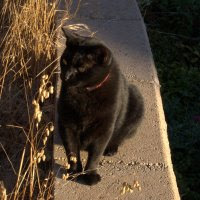 This is a baby Black Beauty. 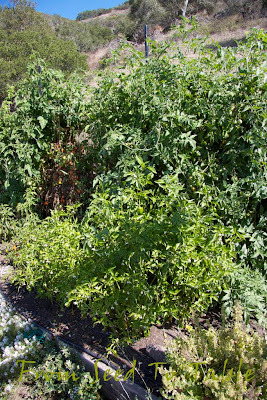 The tomato plants behind are for the most part looking mangy but still producing. 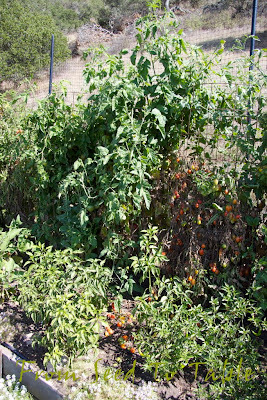 Late planted peppers in the foreground never took off. 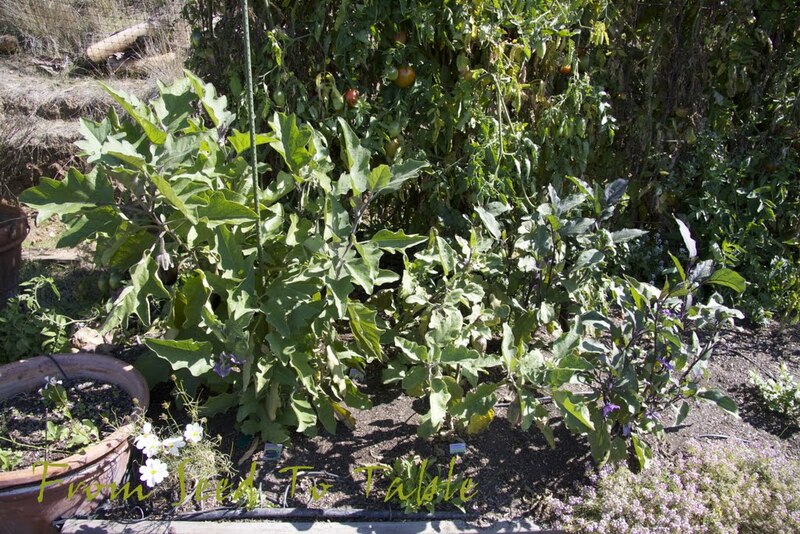 The Diamond eggplants in the foreground are also happier after their treatment for pests and there are a few fruits nearly ready to harvest. 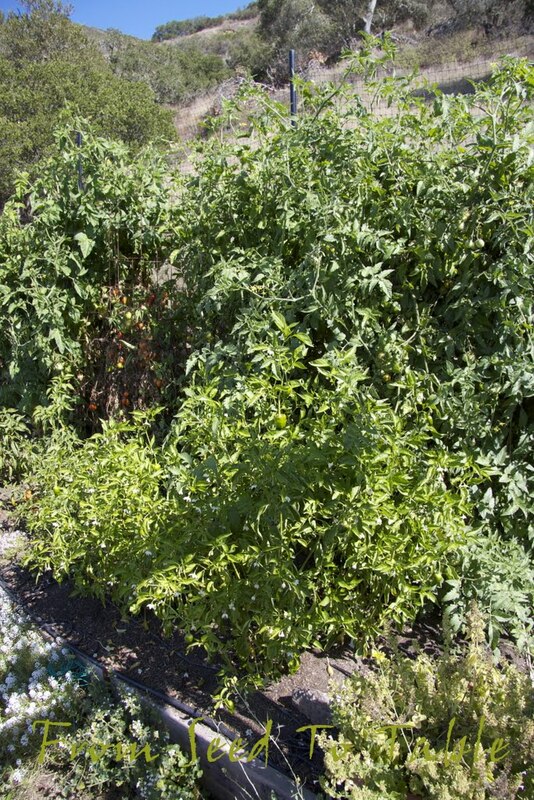 In the background you can see the very healthy and highly productive Japanese Trifele tomato plant alongside the nearly dead but loaded Fiaschetto tomato plant. 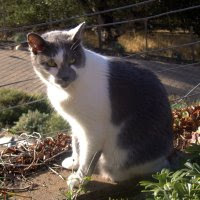 I need to go over the Fiaschetto to see what I can harvest from the mess, a cursory look yesterday leads me to believe that I can salvage quite a bit. The Pimento de Padron peppers in the foreground made quite a comeback after I treated them with Actinovate for a suspected fungal infection and they also got some extra food which brought them back into production. 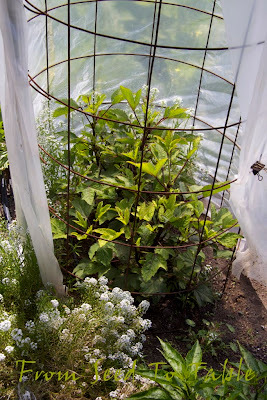 Behind the Padrons are the super vigorous Aunt Ruby's German cherry tomato plants, two plants in one cage. 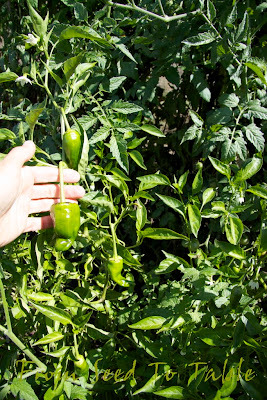 The plants are covered with tomatoes but they seem to have inherited the late ripening characteristic of the Aunt Ruby's German Green half of their parentage. These also seemed to have a tendency to split from the rain that we had a couple of weeks ago. And if it ain't rodents it's rot. I managed to salvage about half of this head of Hybrid One Kilo. I think I'll give this bed a drench with Actinovate. 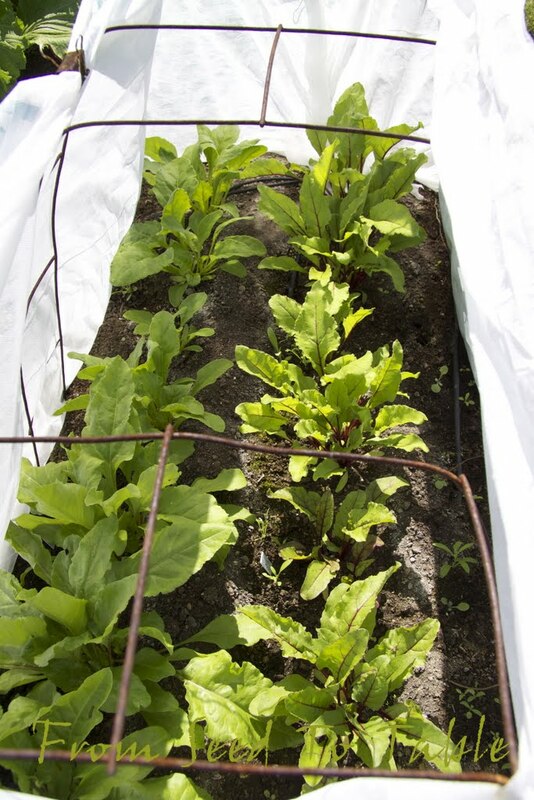 The remay covered frame to the left in the photo previous to the one above is protecting a new planting of beets. 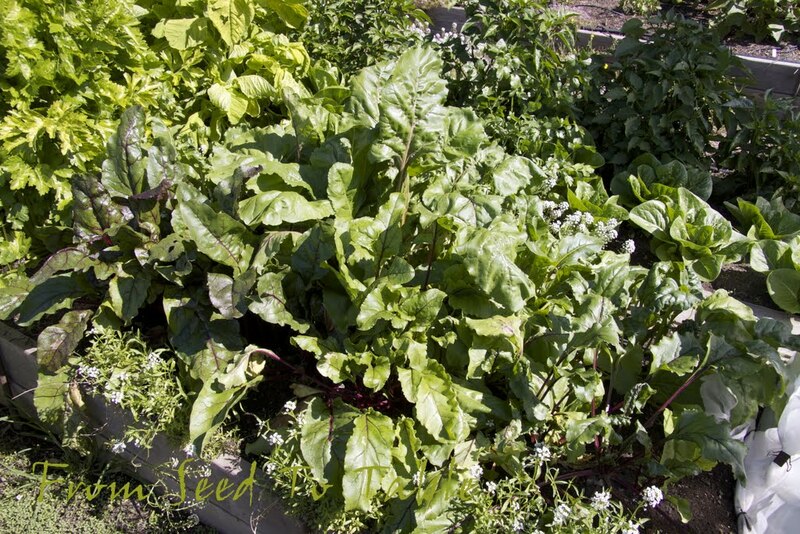 Next to the new beets is a patch of earlier planted beets that are ready for harvesting. These are Chioggia beets. 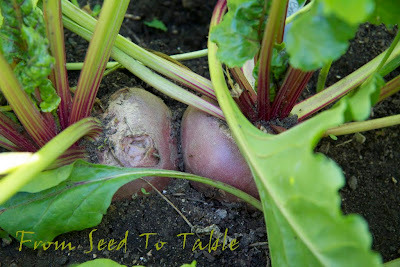 I start my beets in paper pots with 2 to 4 seeds per pot depending on how old the seeds are. 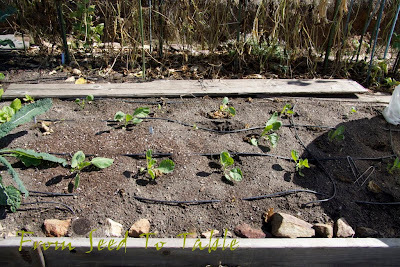 When I plant them out I leave all the seedling to grow and wait to start thinning them until the roots are large enough to harvest as very small babies. Then I thin the clumps to 3 or 4 plants per clump that is growing from the paper pot. A week or so later I'll thin them again to 2 or 3 plants per clump. 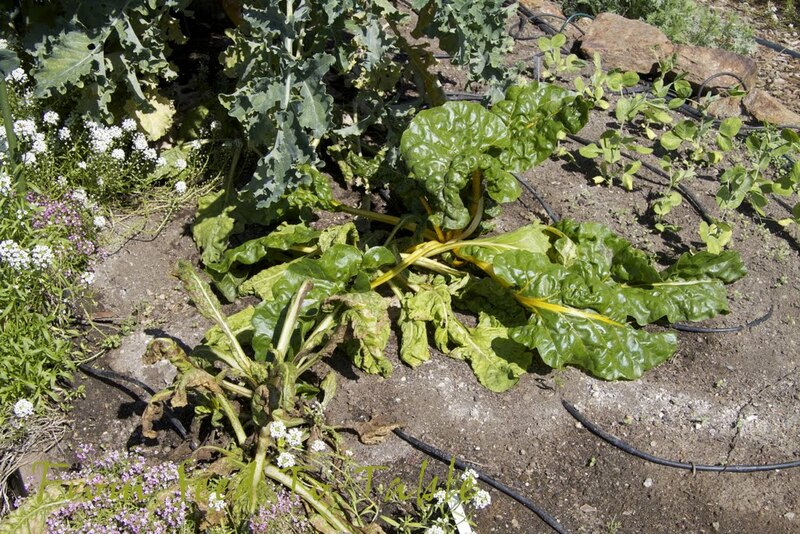 I've found that round beets don't mind being a bit crowded, they just push each other up and out of the way without becoming deformed, pointy or elongated beets are too strongly anchored into the soil and become deformed when they get too crowded. Before I left for vacation two weeks ago these had 3 or 4 beets clumped together and I thinned them all to 2 beets per clump just before I left. Now I'll harvest half of them to leave one plant for each original paper pot and then I can harvest the rest of them in a week or so. Next to the beets are Dorato di Asti celery, an Italian heirloom that has a slightly golden color. 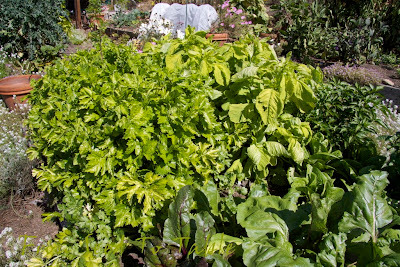 To the right of the celery is the Tender Leaf Amaranth that is growing like crazy now that the weather has finally warmed up. 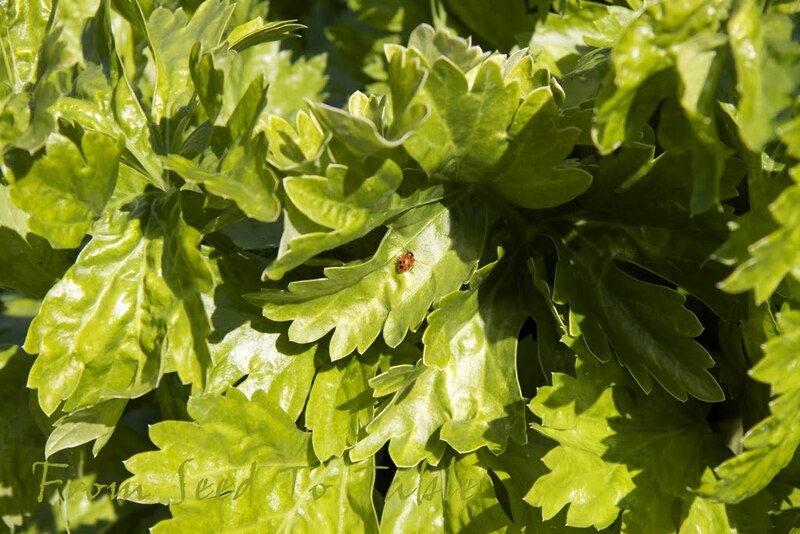 The leaf color is nearly identical to the color of the celery leaves. It's good to see the lady bugs still at work in the garden, the ants have been farming the aphids in a number of the vegetables and making a huge mess. Eat up girls! I've tried the same method with the celery that I just described for the beets. I've been successively thinning out the celery plants until two weeks ago there were 2 plants per original pot that I set out. I've started cutting out one of the two plants in each clump, but once I'm down to one plant per original pot I will try harvesting the outer stalks of the plants until I need to clear out the bed in a couple of months. Sweetie baby romaine lettuce plants that were planted out a few weeks ago are sizing up quickly. 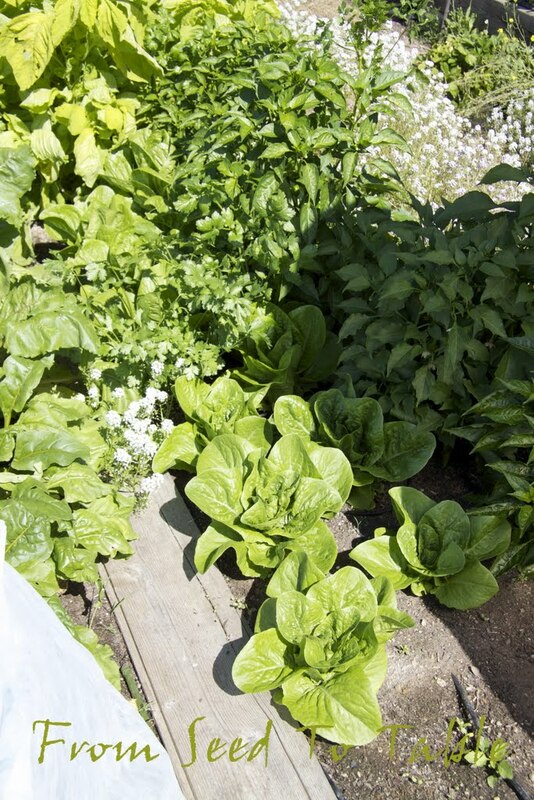 Behind and to the right of the lettuce are some very late planted pepper plants that are doing surprisingly well. It looks like I might get to harvest some Shishito peppers after all, these are doing much better than the first plants set out in the solanum bed, go figure. Woo hoo, the hibiscus plants are loving their mini greenhouse! I think that they have at least doubled in size in less than a month. Even though they may not get large enough to produce much of a crop this year I know now how to get them going earlier next year. See my garden overview for September 20 for a bit more about this. On to the last bed in the vegetable garden. The ants and aphids have completely done in the Golden Chard. Well, that means that I'll have room to put in some Flamingo chard. Can you guess what color that's going to be? 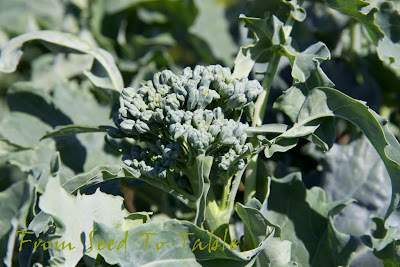 The di Sarno Calabrese broccoli is pumping out the side shoots. 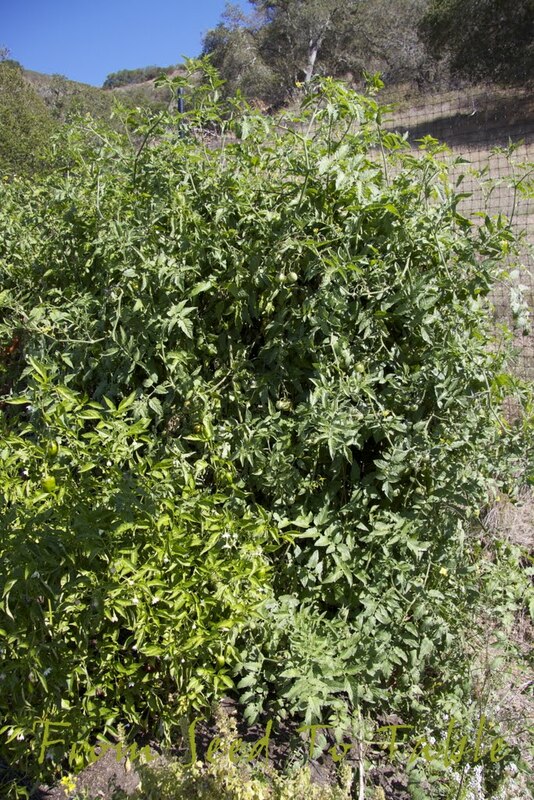 Here's the plants before I went through and harvested over 2 pounds of shoots on Sunday. The Piracicaba broccoli grows much more quickly than the di Sarno broccoli and in the space of two weeks the tiny new side shoots bolted into bloom. 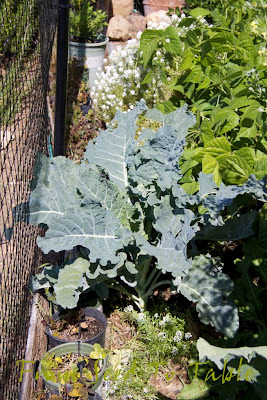 I trimmed these on Monday and Tuesday and fed the overgrown shoots to the chickens. 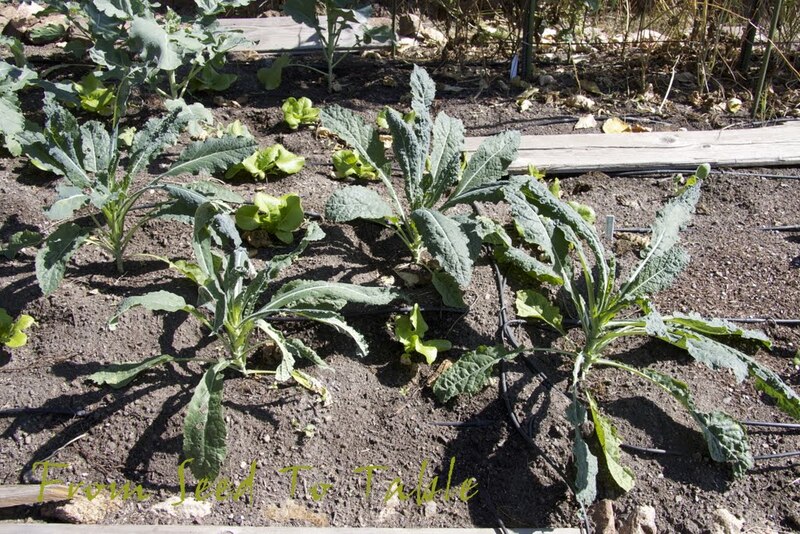 I'm not sure if the plants will produce good side shoots again after getting so large but I'll give them a chance. A volunteer Portuguese Dairyman's kale that volunteered in the path from seeds that dropped from the plants that I let go to seed last year. Not so bad looking. 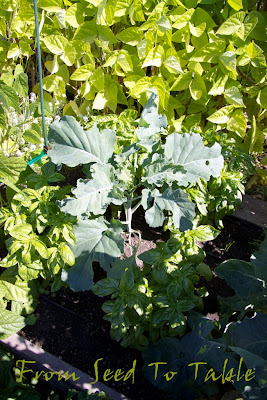 A new Purple Sprouting broccoli seedling set out in the middle of the basil patch is growing well. The basil doesn't seem to mind yet, I harvested enough to make a batch of pesto and left plenty on the plants to spare. 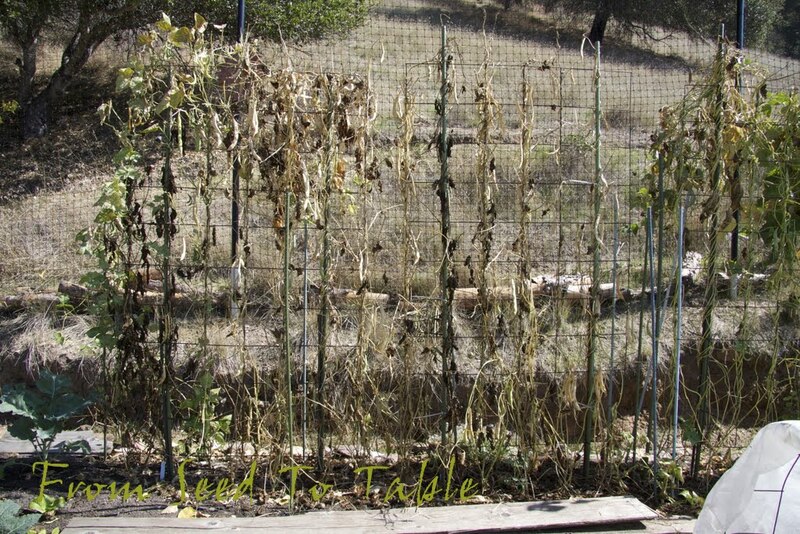 To the rear are some Rolande filet bean plants. The beans were setting and some were nearly ready to harvest when I left for vacation 2 weeks ago. I was quite pleasantly surprised to find beans that weren't too overgrown, or to find any beans at all, I rather expected the rats to clean out the patch. 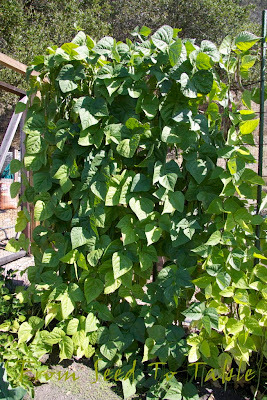 The Neckarkönigin green bean plants are looking good. 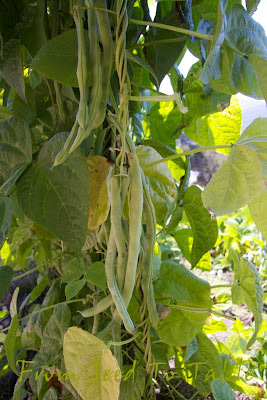 The beans were nearly ready to harvest two weeks ago and I thought that these too would be old and tough. A number of them are rather large but are surprisingly still tender and not stringy. The Diamante celery root is growing at a leisurely pace but looking good. Thank goodness the gophers seem to have eased up on it, one of the half eaten plants is even still growing! 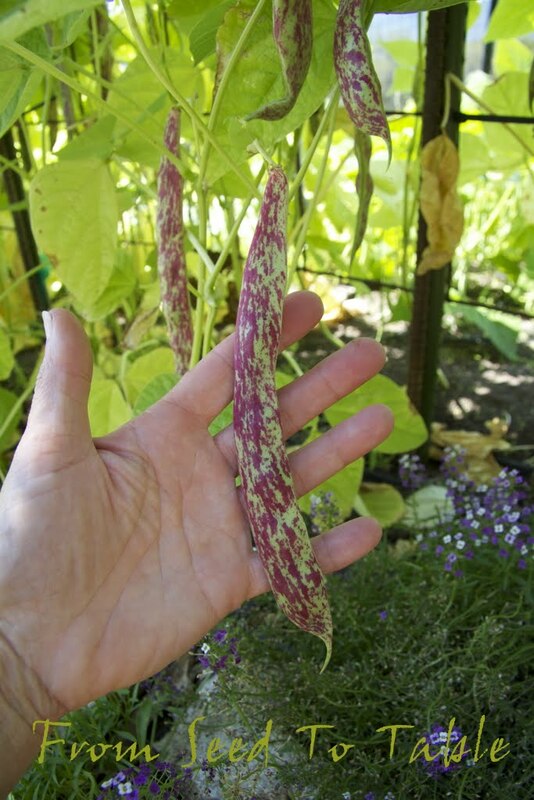 The Stregonta borlotti beans have set a good number of pods. You can see the plants a few photos above growing to the right behind the bolting Piracicaba broccoli. 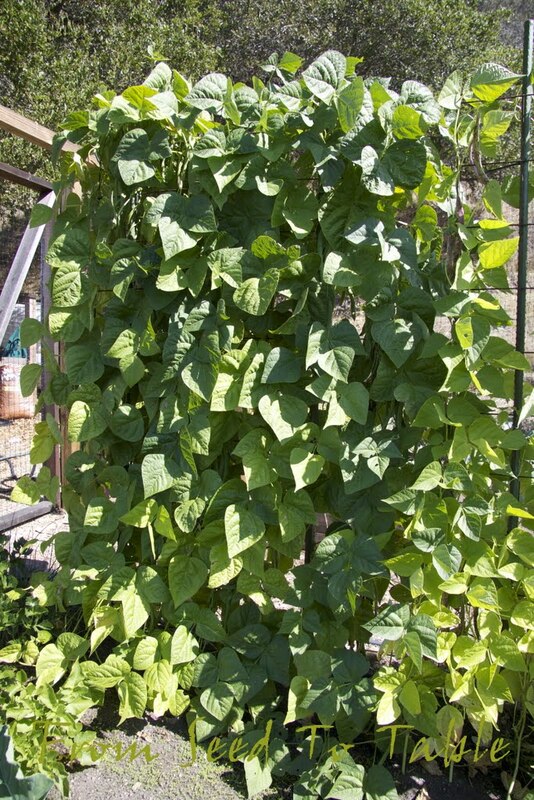 I hope that these will mature in time to get some shelly beans, I doubt that there's enough good weather left to get them to the dry bean stage though. One last plant and dash before leaving two weeks ago didn't fare as well. There were Super Sugar Snap pea seedlings in addition the the Golden Sweet snow pea seedling that you can see here. I guess the snap pea seedlings are much tastier than the snow pea seedlings, the rats turned up their noses at the snow peas after taking a few nibbles. Gads, I can't believe what discriminating palates the rats have. 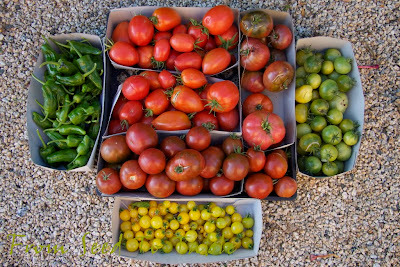 They even favor the best tasting tomatoes (Black Krim) over the rest of the tomatoes. That's it for the October garden tour. What's growing in your garden at this time of year? Oh, it is so nice to be back in my garden after a couple of weeks away on vacation. Vermont was beautiful even though the fall colors were nearly a no-show and a week in the din of Manhattan was enough to last me a lifetime. What I miss most while traveling is fresh vegetables, well, really any vegetables prepared in an interesting way. I find it to be tremendously difficult to find vegetables on a restaurant menu that aren't indifferently or downright poorly prepared. Even when a restaurant boasts about the local seasonal fresh vegetables that they prepare they are usually a tiny portion paired with a big hunk of protein rather than my typical meal of a plateful of veggies with a bit of protein added for flavor or substance. 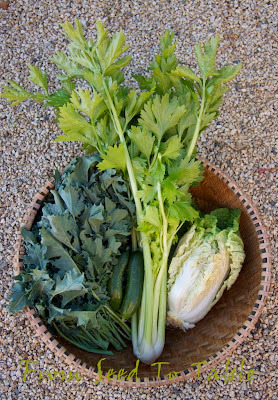 So it was a huge relief to find plenty of fresh vegetables to harvest from the garden yesterday. 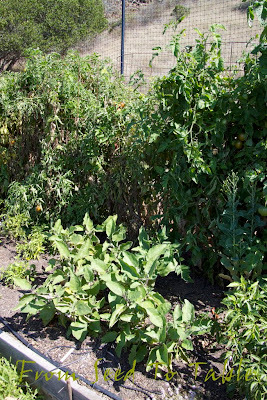 The tomatoes haven't given up yet and the rats seem not to have been too greedy. Counter clockwise from the top left the tomatoes shown are Amish Paste, Japanese Trifele, Galinas cherry, Aunt Ruby's German cherry, one Chianti Rose, a couple of Gigantesque (not at all giant), and a few Black Krim. And on the far left is a carton of Pimento de Padron peppers. I also have a bunch of tomatoes that I harvested the day before I left for vacation and left for my house sitter to stash in the freezer as they finished ripening (after she took as much as she wanted or gave to her friends with my blessing). Those aren't included in the harvest totals yet. 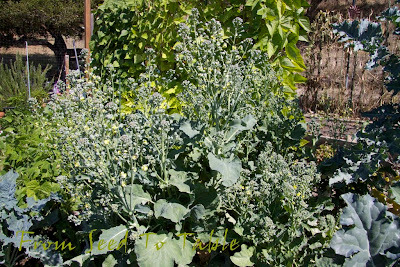 The Di Sarno Calabrese broccoli had a lot of side shoots that were ready to harvest, a couple of Green Fingers Persian cucumbers weren't too huge, one of the napa cabbages was starting to spoil but I was able to rescue a good portion of it, and the celery is growing like crazy and still not completely thinned out so I harvested another head of that. Wow, the Neckarkönigin vines were loaded with green beans that were ready to harvest. A lot of the beans were very large and starting to get a bit lumpy with developing seeds but all except the very largest turned out to be not at all stringy and still tender and tasty. I used the cabbage, about half the celery, some of the largest beans, and some of the tomatoes along with some frozen favas and pantry onions and garlic to make a big pot of vegetable soup last night. I also whipped up a batch of pesto with basil fresh from the garden to stir into each bowl of soup. Mmmm, that satisfied my vegetable cravings and also seemed to be therapeutic for the cold that I dragged home with me. Not included in the totals this week are the vegetables that I harvested the week before I left because I lost my notes for that week, dang it. I might have broken the 500 pound mark this week with those vegetables and the still unweighed frozen tomatoes. 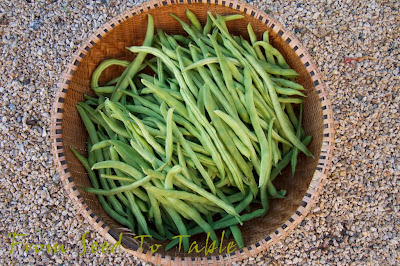 Neckarkönigin green beans - 8 lb., 15.5 oz. Di Sarno Calabrese broccoli - 2 lb., 5.8 oz. Hybrid One Kilo napa cabbage - 1 lb., 9.5 oz. 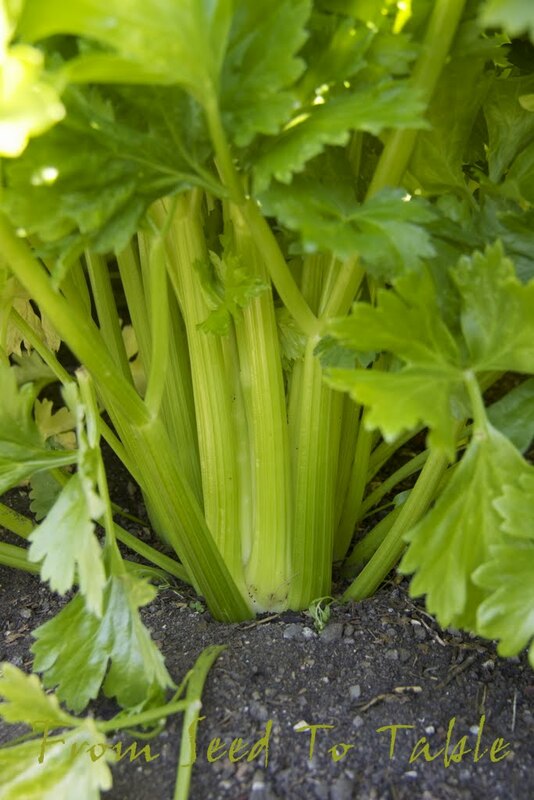 Dorato di Asti celery - 1 lb., 5.5 oz. 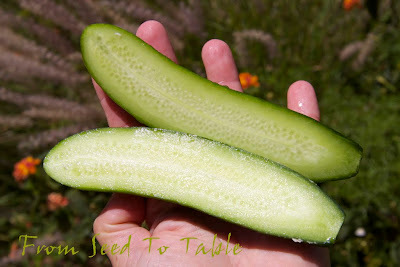 Green Fingers cucumbers - 5.7 oz. Pimento de Padron peppers (excluding the over sized ones) - 15.4 oz. Amish Paste tomatoes - 7 lb., 13 oz. Aunt Ruby's German cherry tomatoes - 2 lb., 12.7 oz. Black Krim tomatoes - 2 lb., 1.7 oz. Chianti Rose tomatoes - 7.8 oz. Galinas cherry tomatoes - 1 lb., 5 oz. Gigantesque tomatoes - 7.1 oz. Japanese Trifele tomatoes - 6 lb., 9.5 oz. Unidentified tomato variety - 8 oz. The total harvest for the week was - 37 lb., 9.7 oz. 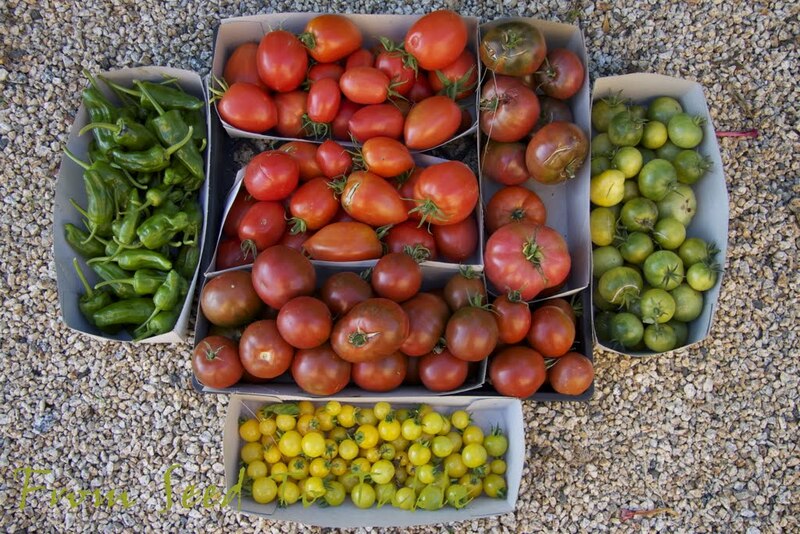 The total harvests for the year have been - 457 lb., 2.4 oz.